We gladly accept American Express, Visa and Master Card, no personal checks accepted. Patio Seating and Private Dining space available. Please restrict cellular phone use to front lobby. 5.00 split plate charge on any entrée. 20% gratuity will be included on parties of 6 or more. 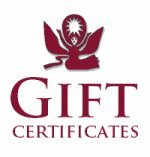 Compound Gift Certificates - So Perfect for any Occasion. The Compound Restaurant is a non-smoking establishment. No animals allowed except service animals.